Russell Denver says the region needs a comprehensive strategy to close the skills gap that is leaving many positions unfilled at area companies. That was his way of describing a regional and national thrust toward environmentally friendly technologies, products, and practices that made its presence known in Western Mass. in 2007, in terms of some new businesses and jobs, and may be a harbinger of an economic development niche for Western Mass. These ‘green’ advances, such as the emergence of SunEthanol, an Amherst-based venture that is trying to revolutionize the production of ethanol through the use of something called the Q-microbe, were some of the highlights of a year that Blair described as mostly “vanilla” from an economic-development standpoint. There were no big “hits,” as he called them, in terms of new employers or relocations, but, conversely, there were no big losses, either. Absent those large hits, the region essentially worked on what Blair called “building blocks,” the ‘green’ movement being just one of them. Others include ongoing efforts to retain and possibly grow the region’s precision manufacturing base; maintaining and bolstering the strong health care and higher education sectors; and continued progress in efforts to revitalize Springfield. There was also considerable movement on what would have to be called the transportation front, with a new direct flight from Bradley International Airport to Amsterdam, and the arrival of low-cost airline Skybus at Westover Municipal Airport. The carrier will soon have two arrivals and departures each day, with flights from and then to Columbus, Ohio and Greensboro, N.C.
Taken together, these building-block-bolstering efforts have provided some momentum for 2008, said Russell Denver, president of the Affiliated Chambers of Commerce of Greater Springfield. He told BusinessWest that while the national economic picture might be quite fuzzy, and there are several factors that could impact things locally in terms of job growth, new business development, and continued progress in Springfield, he is optimistic about this region and its prospects for the short and long term. He said that perhaps the biggest of those building blocks to improved economic health and well-being is workforce development, and in Greater Springfield, there is much work to be done in this regard. Specifically, the region has to mount an offensive to close the gap between the skills required by area employers and those possessed by most job seekers and the unemployed, and thus fill an alarmingly high number of vacancies and assure prospective new employers that the region can meet their workforce requirements. “The fact that we have so many jobs available is a good sign, but the fact that we don’t have enough qualified individuals to fill these jobs is a real negative; the high drop-out rates that we’ve seen recently in Springfield and Holyoke, especially, have come home to roost,” said Denver, who told BusinessWest that an action plan will be prepared early next year to map a strategy for improving the quality of the region’s workforce. 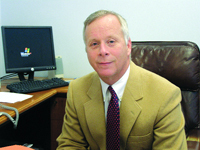 Bill Ward, executive director of the Regional Employment Board of Hampden County, which will draft the report at the request of outgoing Springfield Mayor Charles Ryan, said it will go well beyond drop-out rates and focus on factors — ranging from early childhood education to English as a Second Language; from getting more people into area nursing schools to keeping college graduates in this market — that will eventually yield a better-qualified pool of workers. Beyond these workforce issues, Denver sees many positive developments, from the emergence of greater fiscal stability in Springfield to the availability of permitted land in the city’s Memorial Industrial Park; from continued healthy growth in new small businesses to new opportunities in tourism. In this, our annual ‘Economic Outlook’ focus, BusinessWest looks at the prospects for 2008 and beyond, and the issues that will determine if, where, and how growth occurs. How Green Grows the Valley? Looking toward the year ahead, Blair acknowledged that the regional and national forecasts are punctuated by question marks and growing concern about a recession. Many of the issues that will determine what happens with the economy — from energy prices to the subprime lending crisis and credit crunch; from soaring construction costs to the strength of the dollar (or lack thereof) — are simply beyond this region’s control. This theme of ‘being ready’ is a common thread with many of the region’s economic-development strategies, said Blair, including workforce quality-improvement efforts, readying parcels like the former York Street Jail and Chapman Valve site in Springfield for development, initiatives to put qualified machinists in the pipeline, and even casino gambling. And it is especially relevant with regard to the ‘green’ movement, said Ellen Bemben, director of the Regional Technology Council, which is developing a multi-faceted strategy for cultivating a green-related cluster in the Knowledge Corridor. Bemben told BusinessWest that SunEthanol, which has garnered press across the country and is starting to amass needed capital, is easily the most visible of the green-related ventures taking root in the region. The company looks to use the Q-microbe, discovered in the soils off a hiking trail on the Quabbin Reservoir (hence the name) to create ethanol from a wide range of plant materials, rather than corn, thus speeding and facilitating production of the alternative fuel. But there are many others flying under the radar screen. And they encompass several different components of what is becoming a broad sector, including photovoltaic (solar power) businesses and installations, fuel-cell makers, alternative-fuel providers, and even windpower operations. And there is apparently great interest in further development. Both Bemben and Blair tend to group sustainable energy and biotech developments under the same (green) roof with regard to cluster development and jobs, and Bemben believes there may be anywhere from 3,000 to 5,000 people employed in this sector across Massachsetts and into Northern Conn., with vast potential for more, especially in sustainable energy because of a quicker path from the lab to the production plant. Blair agreed, but stressed repeatedly that virtually every region of this state and many other areas around the country are trying to get into this game, and the competition will be steep, meaning that the region has to put its best foot forward and be aggressive — and ready. Especially if Gov. Deval Patrick’s plan to pump $1 billion into the biosciences effort is passed by the Legislature — and most believe it will — and $100 million a year will be made available to players in that market for research and development. The emerging ‘green’ cluster is one of many that will need skilled workers, at a time when many already-developed sectors, including health care, precision machining, and financial services, are struggling mightily to fill vacancies. This trend applies to not only the private sector, but also the public sector, he continued, noting, for example, that area communities have hundreds of openings for teachers every summer, and most struggle to fill them. Filling existing vacancies and closing the sizable skills gap is of paramount importance to the region and its future, said Ward, and for obvious reasons. When it comes to the precision machining sector, it’s hard skills, or the lack thereof, that is dogging those in that industry. Larry Maier, owner of Peerless Precision in Westfield and president of the local chapter of the National Machine Tooling Assoc. (NMTA), didn’t raise his name, but implied that shop owners are feeling a little like Sisyphus pushing that rock. Finding enough qualified machinists is certainly an uphill battle. A recent survey of area shops revealed vacancy numbers that project to somewhere between 400 and 500 job openings in the region, he said. Meanwhile, with a retirement rate of 3% to 4%, there are another 200 or so vacancies each year, and the six area vocational high schools are graduating perhaps 30 or 40 people a year that are qualified for only entry-level jobs. All this math provides ample evidence of the challenge facing area shops, most of which are either farming out work it can’t handle due to a shortage of workers (Peerless is in this category) or simply turning it down. There has been some progress made toward putting more bodies in the pipeline, he continued, noting programs involving Springfield Technical Community College, Asnuntuck Community College, and the Mass. Career Development Institute to enhance the training of those already in the field or actively looking to entering it, and the resumption of the Manufacturing Technology program at Putnam Vocational High School in Springfield next month. But the sector must be diligent in pursuit of new avenues for gaining machinists, even if there is a downturn in the economy, because it takes several years for qualified help to come out of the pipeline. “Take the Putnam program, for example; it will be four years before an entry-level person graduates from it — that’s a long time,” said Maier. “To get a skilled machinist, one who could replace a retiree, that takes another five to 10 years. Workforce issues comprise one of many challenges still facing Springfield in particular, said Denver, who, like Blair, noted that the city, through the Finance Control Board, has managed to put itself back on more-solid financial footing, and probably has the worst of its public relations problems behind it. In fact, it has started to pick up some positive press both locally — in the form of a coordinated marketing campaign built around the theme “Springfield’s Back” — and nationally, including a large spread in United Airways Magazine that was seen by an estimated 5 million people. But while the city is seeing progress in some areas, said Denver, considerable work remains to reduce both crime and fear, improve on those aforementioned drop-out rates, and put some abandoned or underutilized parcels — several of them identified in the Urban Land Institute report on Springfield — back to productive use. The York Street Jail is slated for demolition early next year, he said, and there is considerable interest in the site, including that of an unnamed developer who has forwarded a proposal to build an indoor basketball court complex that will attract youth tournaments and build on the riverfront’s basketball- and fitness-related development pattern. The Chapman Valve plant in Indian Orchard is also slated to be razed soon, said Denver, providing several different development prospects, and a request for qualifications will be issued shortly for 31 Elm St. in Court Square, which could be converted into a hotel or market-rate housing. The broad goal is to make Springfield a more attractive destination for tourists, professionals, and business owners, said Blair, noting that while many area communities are thriving despite Springfield’s recent problems, a healthier City of Homes benefits the region as a whole. n and out of Westover in mid-July, and five months later, Blair is still closely monitoring the passenger counts on the inbound and outbound Columbus flights. “There’s been a few dips, but overall, we’re still seeing about 100 people on the outbound flights and maybe 130 on the inbounds,” he said, noting that the numbers may change following a schedule shift from early evening to midday. Inbound flights now arrive in Chicopee at 11:30 a.m., and the outbound departs an hour later. “Some people like the change, and other people don’t,” said Blair, noting that some business travelers preferred getting in to Columbus at night, giving them a full day in the city the next day, while others like getting into Ohio earlier in the day and perhaps catching a connecting flight to another destination. Monitoring passenger volume is a big part of the effort to gauge the economic impact of Skybus, said Blair, noting that the service is providing a boost to several tourism- and hospitality-related businesses. It is hoped that the airline — and continued improvements to Springfield’s image and finances — will bolster the tourist sector and bring more business to the MassMutual Convention Center. Overall, Blair said he believes Springfield, despite some lingering concerns about education and public safety, has turned some kind of corner. Returning to the subject of the national economy and its impact on the Pioneer Valley, Blair said that even in down times there is “movement,” meaning job growth in the form of new ventures and relocations. “Looking back, I’d say that some of our better years have come during down cycles,” he said, citing some large-scale developments in the early ’90s, at the height of that recession, and others in the mid-’80s, during another downturn. If history can repeat itself, maybe the region can enjoy a more exotic flavor when it comes to economic development. Perhaps pistachio — it’s green.